Any time we have the opportunity to geek out and give back, we jump at the chance. 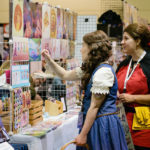 In a few weeks, GeekGirlCon will participate in The Gauntlet, a gaming tournament run by Card Kingdom that will raise money for Child’s Play, a charity dedicated to improving the lives of children in hospitals around the world with toys and games. The event is Sunday, May 18 starting at 3 p.m. The tournament consists of five separate games: Ticket to Ride, Magic: the Gathering, Geek Trivia, Ugg-tect, and Suspend. 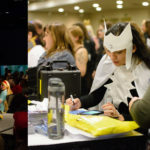 We’ll have a team of four representing GeekGirlCon for this combination of games, and we’ll compete against some of gaming’s greatest, including Bungie, Card Kingdom, Cafe Mox Regulars, Lady Planeswalker, Paizo, Penny Arcade, Removed from Play, Sucker Punch, and Wizards of the Coast. We’re in for some tough competition, but we’re also really excited to get our geek on and support such a great cause. Teams have the ability to earn Power-Ups before the event based on the amount of funds they raise for Child’s Play. These Power-Ups can be used throughout the tournament for a range of purposes. Want to help give our team a boost? Head to TheGauntlet.me and click the donate button at the bottom of the page. Then, be sure to type “GeekGirlCon” in the Comments section on the donation page. You’ll be supporting an amazing charity AND helping the GeekGirlCon team earn some Power-Ups during the tournament. Every little bit helps—even a dollar! For those of you who live near Seattle, we’d love to see you at The Gauntlet. 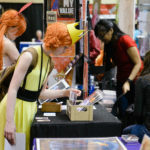 Head to Card Kingdom on May 18 to take in all the action. There will also be prizes and other games to play for supporters in the audience!